Shazam may be the app to have when you want to identify a song that you don't know, but did you hear that now you can do the same thing with videos as well? Apparently, some folks have come up with an application that lets you get detailed information about a TV show, movie, music video, or pretty much whatever happens to be rolling on a screen nearby. The app is called VideoSurf and you use it by simply pointing your smartphone's camera at the media. After capturing a short stream of video information, VideoSurf uploads the data to its mothership (read its home company's servers) where the whole magic happens. That is the way VideoSurf should work in theory. However, the program has been getting mixed feedback so far, but a little more polishing and bug fixing might help it go viral. Right now, the app seems to be available for Verizon' Android smartphones only, but we have the feeling that the guys at XDA-Developers might be able to do something about it pretty soon. Besides that, judging by the screenshots over at VideoSurf's official web page, the app may be coming to the iPhone as well. 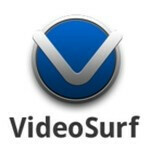 Feel free to check out VideoSurf in action in the video below. To download VideoSurf for Android, click here. I hope they bring it to the Playbook, looks amazing! doesnt the playbook also have access to the android marketplace? i know the article said its a VZW android app for now but if they generalize it to android as a whole then the playbook should be able to download it as well. Cool concept, I only wish google was doing it instead. With the massive data pool they use to bump copy written music and video from you tube it would actually have a chance of pulling it off comprehensibly. To bad! im an iphone user!